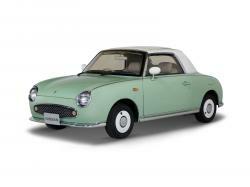 Correct Wheel Sizes, PCD, Offset, Rims and Tire specs for Nissan Figaro series. I would like to plus size my figaro wheels can u please tell me max specs of wheels that can work rim tire specs? Hi, Dan. We suppose that this is max spec for Figaro. Tire: 165/45 R15; rim: 15X 7J ET40 with 25mm spacer kit. how about a 14" wheel? what would be the best tire wheel combo? I'm liking Calibre Vintage alloys 15/7. I'm told by several fitters that they will just fit on my Nissan Figaro, with 195/45/15 tyres. They have had a look at the Figaro wheel arches. It should be ok. But, I'm worried that the wheel/tyre combination will be a bit hard? I wonder if I could improve things with a different tyre? Unfortunately wheels like the Vinyage are not in 14"! I need to buy new tyres for my Figaro - the present ones say 165 70 12 T - the only replacements that I can find are 165 70 13 T. Will they fit? Hi, Rose Thomas,no,it can not fit for.